These adhesive tin ties are designed with a double wire for a simple, effective way to seal your bag. TTA4WH is our 5 1/2" tin tie that fits 4-inch bags. 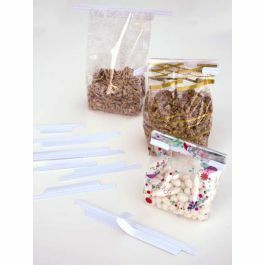 Great for gussets bags, these white twist ties can be used to package favors, gifts, baked goods, bread, rolls, and more. The double wire is fully wrapped in white paper for a clean, professional look. Adhesive tin ties provide an easy way to close your bag by hand without the need for additional machinery. This simple peel and stick tin tie is designed with a double wire wrapped in white paper. Our TTA4WH tin tie measures 5 1/2" in length and is intended for closing 4-inch bags. The adhesive is backed with a peel-off paper strip. Simply remove the backing, stick the adhesive to the bag, and seal your contents. This resealable closure allows the bag to be opened and closed at your convenience. TIn ties work great with gusset bags. Package cookies, favors, gifts, and more. Tin Tie Length: 5 1/2"